Opening the case I got hit by a very strong smell of glue, a proper wow. The set consists of the base unit that has two holes through it, two optics (one with cross-hairs and the other with a circle) and two centres (9.5mm diameter with 60° or 90°). The case that the set arrives in is nice, but a touch on the large side – will have to find a more compact storage solution. The good thing about the case is that it does stop the parts banging together and damaging the Perspex optics over time. 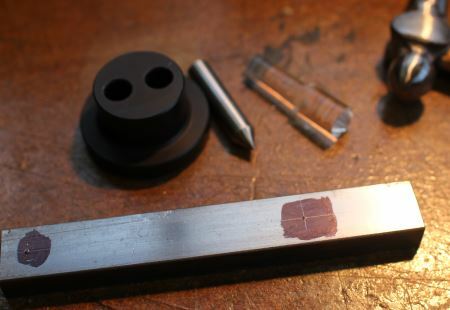 My first use of it was to centre punch the conrod for my current engine project. This shows the mild steel square bar with permanent marker used as a base and then faint centrelines scribed into them. The base has a dense cork type material on the bottom of it to stop it sliding around and this really does work. 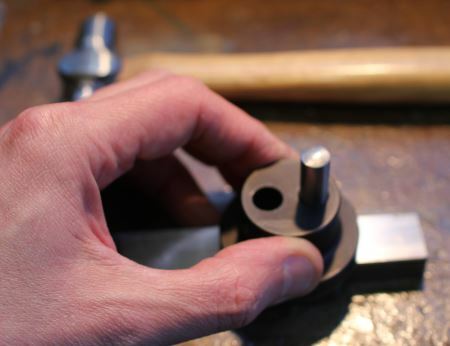 The base was placed on the workpiece with one of the holes roughly over the target. I then used the cross-hairs optical piece to align with the centreline. In the image to the right you can see a bright line which is the scribed centreline and then two fainter dark lines at 90° to each other. These cross-hairs are quite faint, but I found that the Perspex optics really do guide a good amount of light down onto the work. If you stand back off the top of the optical centre finder until the image comes into focus all becomes clear. 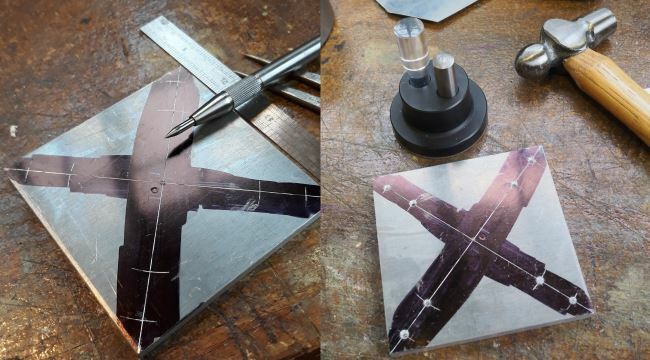 Once the cross-hairs are perfectly aligned, holding the base down onto the workpiece carefully remove the Perspex bar and in it’s place drop one of the centre’s. I must admit that I prefer the 60° punch. One good tap with the hammer and the centre is marked. The precision of this device is fantastic and reduces the time it normally takes me to precisely place a centre, especially as I need glasses I find myself turning the part around and checking the alignment from all angles. The cost of this unit of just under £50 in 2016 is quite high, but the precision you get with it is superb. 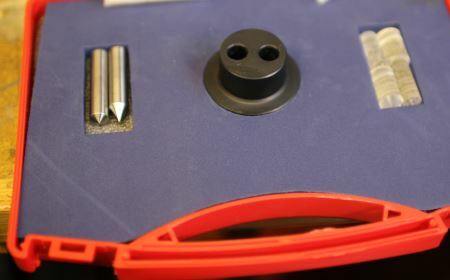 Why the two holes in the base unit….at first I just didn’t understand this, but then had another look at the image on the case and the second hole is so that you can keep the punch and Perspex optics together and accessible. 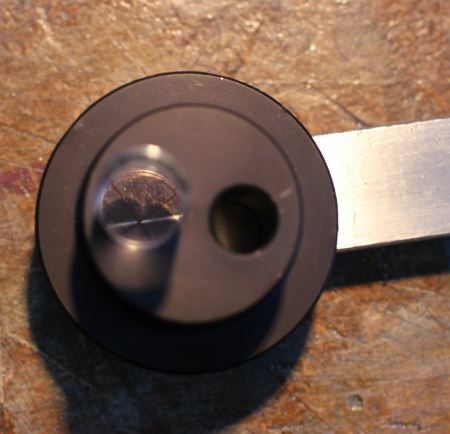 Used the optical punch to accurately mark the backing plate to mount a four jaw chuck to the rotary table.